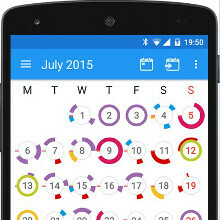 The new CloudCal calendar app for Android brings a breath of fresh air in the management of your daily schedule, with unique "Magic Circles" that let you gauge at a glance which of your hours are free, so you can provide your availability on the spot. It's not only these little clock faces that are the interesting take of CloudCal, though. The app is quick, efficient, and syncs with Google Calendar, Google Tasks, Exchange, Outlook, or hundreds of public calendars in the Pro version. The monthly view is also a godsend for those missing this feature in many popular calendar apps. You can swipe or drag around appointments to dismiss or reschedule, and set resizeable widgets with day, week and month views. The Pro also version lets you share attachments, photos and recordings, as well as maps and locations for quicker scheduling. Take a look at the promo video, and head over to the link below, if you are in the market for a good calendar app for all your time management needs.